Zum den Entsprechenden Sound zu Hören auf das Animierte Notenblatt unter "Sound" Klicken! Wer gern das eine oder andere Sound Files haben möchte kann sich bei mir Melden. Alle Soundfile sind im Format MP3/WMP. Es können mit der Zeit noch mehr Sound Files von Air Hörner hinzu gefügt werden. Wer gern sein eigenes Sound File vom Air Horn veröffentlichen möchte auf dieser Seite. kann sich ebenfalls bei mir Melden. P5 is shorthand for the designation P12345. The picture illustrates a common arrangement of the horn bells, with the #2 and #4 bells reversed. In this configuration, the horn is designated a P135R24. The lengths of the bells decrease as their number increases. In the photo, the #1 bell is at lower right, #2 at lower left, #3 at center, #4 at upper right, and #5 at upper left. This horn also utilizes the older style manifold. The newer manifold, introduced when the P5 was retuned to create the P5a for Amtrak, can be seen on the P5a page. Factory tuning was: A major dominant 7th (C#,E,G,A,C#). Old casting P5's are rarely found in regular service today. Newer, dischordant P-5's are commonly found on older Norfolk Southern locomotives and on Illinois Central. NS began specifying the K-5LA for its new locomotives in the late 1980's, and with the purchase of IC by Canadian National, it is unlikely that IC will acquire additional P5's. P5a is shorthand for the designation P1234a5. The horn uses the new, low profile P-manifold, which moves the two horn bells previously mounted under the manifold up to the sides. The horn is sometimes informally referred to as a "PL5a" to reflect this. The first picture below illustrates that the back caps are not all in the same vertical plane, as they were on the original P5 manifold. The P5a was developed in 1975 at the suggestion of Deane Ellsworth, who had recently moved from Chessie to Amtrak and was eager to find a horn to replace the Leslie SL-4T used on the railroad's SDP40F locomotives. The P5a used a special #4a bell tuned to A# to produce a pleasing C# diminished chord, the same chord Bob Swanson originally had in mind for the M5. The P5a was used on Amtrak's P30CH locomotives, the turbo trains, and the first order of F40PH's (200-229) before it, in turn, was displaced by the K5LA. Factory tuning was: C# diminished (C#, E, G, A# ,C#). 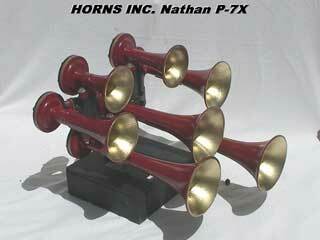 The horn used the P-series #1, 2, 3, 4a, and 5 bells. I'm driving Bill Williamson's 5 chime with two P horns mounted. Bills P-5a, and My P-5 modified, in a runby at a get together at Thornhurst, Pa. 1996. An Amtrak sounds blows its horn as it pulls into the station. Listen to those brakes! A very nice sounding OC P-3 on Reading & Northern's SW-1500 #1548, made by me up at Glen Summit in PA around Spring, 2004. Reading & Northern's SW-1500 #1548 recorded by me 4/15/04, Sounding its very melodious old cast P-3 At Kirby ave.
A Reading & Northern SD-45 with its new cast P-3 eastbound at Mountain Top, Pa.
P3 is shorthand for the designation P124. The picture illustrates a common arrangement of the horn bells, with the #1 bell reversed. In this configuration, the horn is designated a P24R1. The P3 uses the same manifold as the P5 with two of the openings blanked. In the picture, the two openings on the bottom of the manifold (opposite the #2 and 4 bells) are blanked. 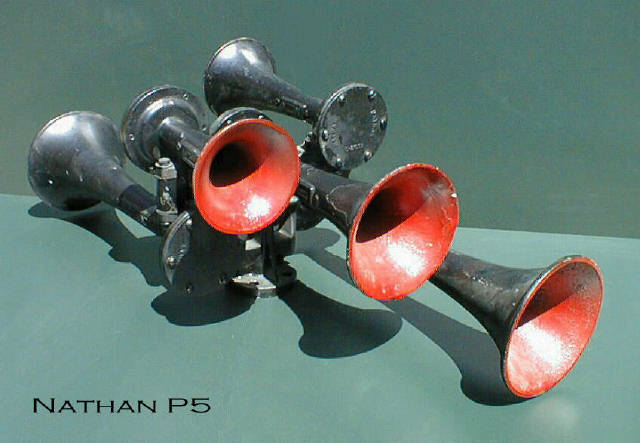 The P3 was first produced in 1952 as a derivative of the P5 (P bells 1, 2, and 4 from the P5). As with the P5, the castings changed over time to produce slight variations in sound. The P3 was the common horn for the Southern Pacific, Northern Pacific and Illinois Central. They were also used on the Spokane Portland & Seattle, and to a lesser extent, on many eastern railroads. Original factory tuning was: A Major (C#,E and A). Newer castings have resulted in a D Minor sound (D,F and A). Some old casting P3's can still be found on older SP, IC, and BN units. New casting P3's are common on former SP and IC units. Union Pacific, historically a Leslie user and more recently a patron of the AirChime K3HA, received P3's on some of their 4000-series SD70M's in 2000. Before the 1990's, most known two-chime P horns in the US used the same manifold as the P5 with three positions blanked. The horns pictured have the bells attached to the two positions underneath the manifold, but in theory they could be attached to any of the five available positions. 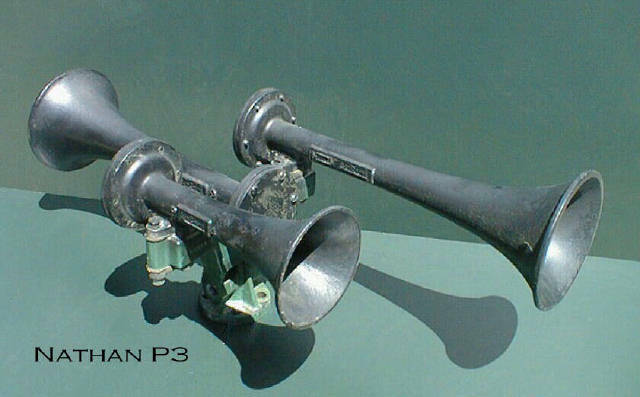 A more compact P2 appeared in the 1990's that utilized a very thin manifold with a horn bell attached to either side. The horn was well suited to commuter railroads that wanted to mount the horn under the cab or behind the pilot of locomotives and cab cars to direct the horn's sound forward and minimize the noise in surrounding residential areas. The horns illustrated use bells 1 and 2. P2's are relatively uncommon on US freight railroads, but Lehigh Valley is known to have used P2's with bells 1 and 2 on many of their Alco C628's. The horns are more common on commuter lines. In Chicago, Metra's ex-IC "Highliner" electric multiple unit cars had P2's reportedly fitted with bells 2 and 3. 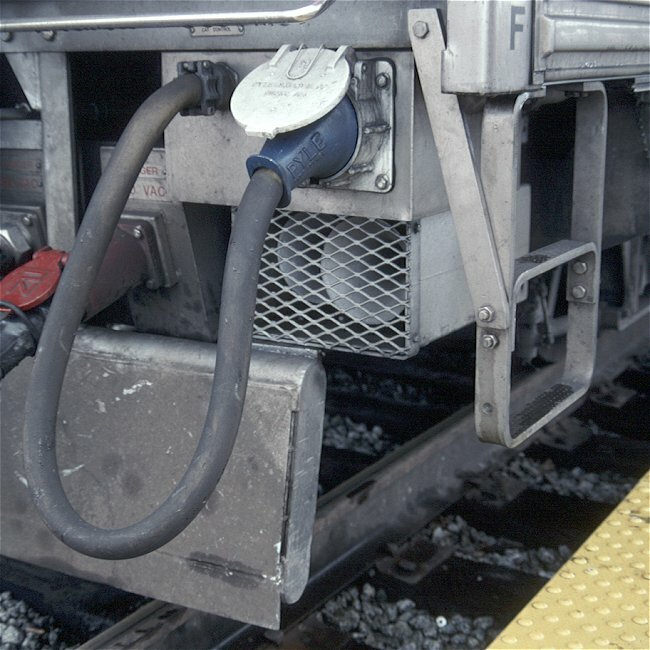 Metrolink in southern California used P2's of unknown configuration to replace Ohio Brass air whistles, which in turn had replaced K5LA horns delivered new with their equipment, all in an effort to minimize noise complaints from residents living near the tracks. San Francisco Peninsula commuter operator Caltrain similarly replaced K5LA's with P2's using bells 1 and 2 over noise concerns in 2001. A P2 with bells 1 and 2 will play C# and E, a minor 3rd interval. A P2 with bells 2 and 3 will play E and A, a perfect 4th interval. Like any horn, a P2 can get fouled by dirt or oil in the air line. 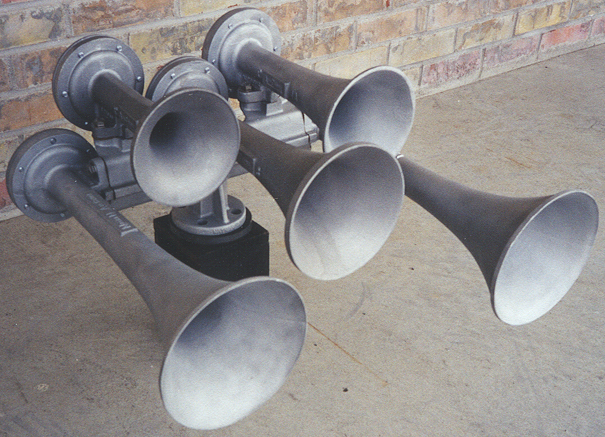 Horns mounted below the frame are especially vulnerable to outside debris, silencing one bell or causing it to squeal (harmonically overblow to a higher pitch). 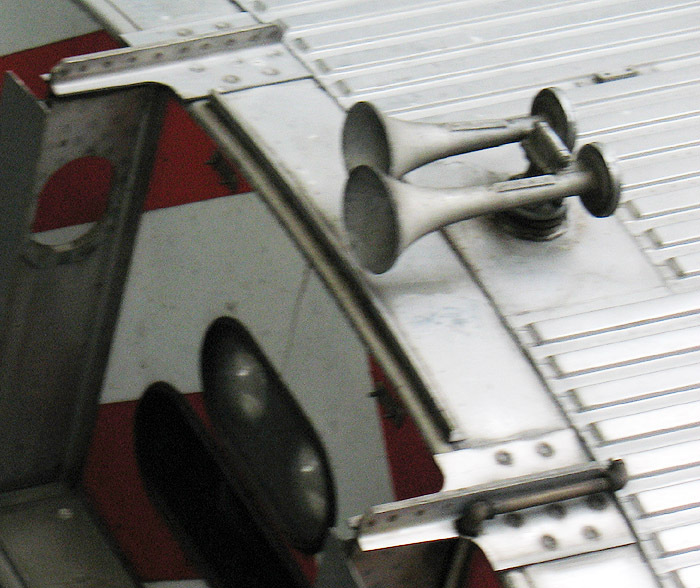 Some Caltrain installations have unusually long pipe runs between the horn valve and the horn, resulting in horns that don't sound crisply. Wer den einen oder anderen Sound gerne möchte kann sich bei Mir Melden. Alle Soundfile sind im Format MP3/WMP. Es werden mit der Zeit noch mehr Sound Files von Air Hörner hinzu gefügt. Wer gern möchte das sein eigener Sound von US-Railroad auf dieser Webseite zuhören ist. Kann sich auch bei mir Melden. Beim veröffentlichen auf dieser Webseite wird beim entsprechenden Soundfile sein Copyright angebracht oder darauf verwissen. Melden und Anfragen bezüglich Soundfiles oder Veröffentlichen - Bitte HIER.